Cathedral satin nickel floor register by Accord Ventilation. This unique geometric design has a tarnish and corrosion resistant finish. 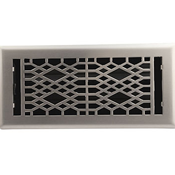 Each metal floor vent comes with an adjustable plastic damper, which means the damper will not rust. The Cathedral satin nickel floor register is tarnish and corrosion resistant, and will stand the test of time. The Accord register is rated to hold up to 200 pounds. 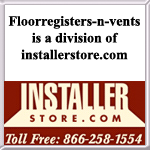 The satin nickel floor register is available in sizes 4x10, 4x12, 4x14 and 6x10. 61-0921 4 x 10 5.25" x 11.5"
61-0922 4 x 12 5.25" x 13.5"
61-0923 4 x 14 5.25" x 15.5"
61-0924 6 x 10 7.5" x 11.5"
This attractive Cathedral decorative floor vent design is also available in the finish Light Oil Rubbed Bronze.